Gatorade had its beginnings in 1965 at the University of Florida, home of the Gators sports teams. Athletes at the school continually battled dehydration in the Florida heat, and researchers tackled the problem by combining water, carbohydrates and electrolytes to solve the problem. The drink was credited with helping to improve the teams' performance, and the sports drink industry was born. Although developed with athletes in mind, Gatorade can be beneficial to those participating in even mild physical activity. Gatorade contains a 6 percent solution of carbohydrates, or 6 grams of carbohydrates per 100 milliliters of liquid. One 8-ounce. bottle of Gatorade contains 16 grams of carbohydrates, according to the USDA Nutrient Database. Carbohydrates are the body's main source of energy. Many athletes consume pasta or other carbohydrates in the days leading up to a sporting event to be sure the body has enough energy for endurance. Researchers at the Australian Institute of Sport's Department of Sports Nutrition state that "the ingestion of carbohydrate before, during and after exercise, are critical to the performance of a variety of sports events, and are a key recommendation in current sports nutrition guidelines." When the body loses more fluids than it takes in, dehydration can occur. Dehydration is a serious condition that can lead to muscle weakness, headaches, dizziness, low blood pressure, rapid heartbeat or unconsciousness. Gatorade is rich in sodium which is responsible for maintaining the balance of water in the body's cells. One 8-ounce bottle of Gatorade contains a full 95 mg of sodium, enough to help replace what is lost through sweat and ward of dehydration. Potassium is beneficial for regulating blood pressure, muscle control and nerve functions. During exercise and physical activity, the body burns off potassium in the muscles and some is also lost through sweat. Gatorade contains 37 milliliters of potassium in each 8-ounce bottle which helps to replenish potassium stores and prevent muscle cramping during exercise. The Colorado State University recommends that athletes involved in strenuous and repeated exercise consume additional amounts of potassium. The developers of Gatorade took great care in creating a flavor profile not too overwhelming to the taste and one that stimulates thirst, helping those participating in physical activity want to drink more of it resulting in beneficial hydration. Researchers at the University of Connecticut conducted a study of children involved in summer soccer and football camps. Between 50 and 75 percent of children at camps where water was available during exercise were significant dehydrated at the end of the session, with 25 to 30 percent at risk of serious dehydration. A similar Canadian study involving bicycling found that children increased their fluid intake by roughly 45 percent when offered flavored water, and by 91 percent when offered a sports drink. 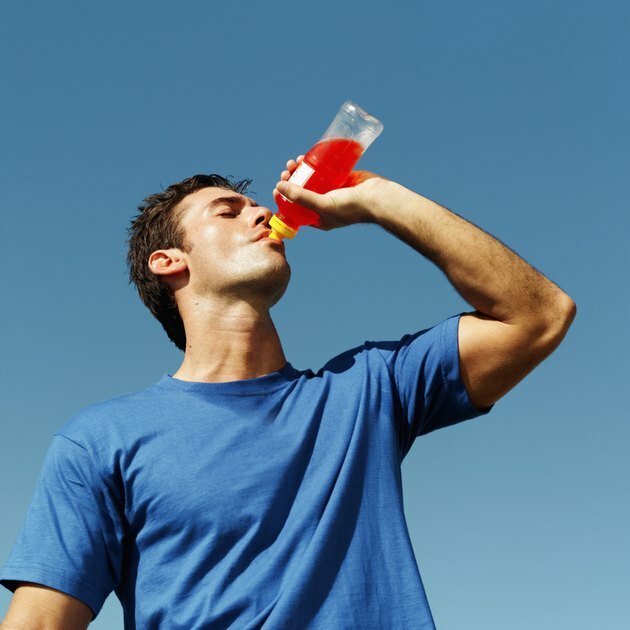 New York Times Health: Are Sports Drinks Actually Good for Kids? USA Football: Gatorade or Water?